Our New T-shirts Are Making a Statement! 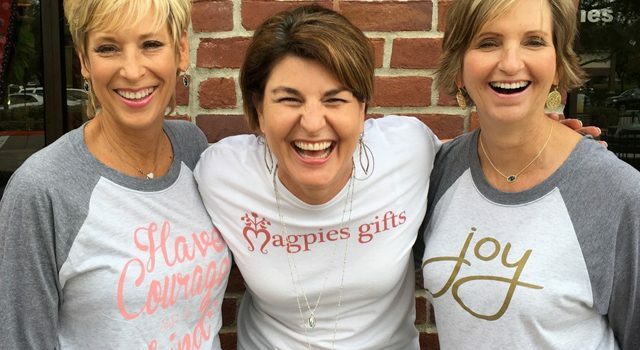 At Magpies Gifts, we try to make positivity and encouragement part of our everyday work. After all, life gets tough sometimes. And if there’s a way to make someone’s day better and spread a few smiles, we are all about it. Recently, our team got to thinking about ways we could incorporate a few more of these good vibes into what we do, and one of our answers might surprise you. We’ve decided to roll out specially-designed T-shirts each season! T-shirts, you say? Hasn’t Magpies already sold those? Of course we have. But these are different. They feature messages and ideals that are close to our hearts. Some will include unique phrases dreamed up by our incredible team members and customers. Their goal is to inspire and invigorate, and each one will have a visual Magpies stamp of approval — our logo. In short, these shirts get personal. We rolled out our “Joy” T-shirt around the 2016 holiday season, and received a huge response from customers. Our next shirt offers simple life advice: “Have courage and be kind.” It’s a phrase from the newest Cinderella movie — wise words from the heroine’s dying mother. As for the next design, who knows? We welcome suggestions from each and every one of you. Is there a phrase you love that would make a great design? Have a clever remark which might benefit the rest of us? Is there a color pallet that speaks to you? Whatever the case, we wanna know! You can visit our Contact page, where you’ll find every possible way to get in touch with us. Don’t hold back! We’re looking forward to all the great ideas we know you have.